There is perhaps no sector more dependent on the use of mission-critical comms than aviation, involving as it does life-or-death information being continually transmitted between those in the air and on the ground. As we saw with incidents such as the in-air disappearance of Malaysia Airlines Flight 370 in 2014, for instance, it only takes one glitch in communication – in that case the mysterious failing of the plane’s transponder – to contribute to a tragedy that grabs the attention of the whole world. History is likewise also full of incidents taking place at airports themselves, where mis- or faulty communication has led to, often massively high-profile, disasters. A relatively recent example of this took place at Linate Airport in Milan in 2001, when issues around communication contributed to a runway collision between two planes and the subsequent death of 118 people. As well as the life-critical aspect, however, commercial aviation is incredibly dependent on digital communications to help it run in the most effective and efficient way possible. There is, after all, arguably no environment in which time is more of the essence than an airport, with larger sites such as Hartsfield-Jackson in Atlanta dealing with more than 2,000 flights in a single day. At the same time, the task of getting a plane into the air is both hugely complicated and labour-intensive, involving any number of different processes taking place around the facility. Clearly, while you don’t want the aircraft to crash, you also need to make sure that it gets away on time, carrying the requisite fuel, passengers, gin, vacuum-sealed scones, sick bags and so on. This is an area in which digital communications has made an enormous impact, with a variety of solutions now available to help staff on the ground keep on top of everything, both front of house and behind the scenes. These range from traditional, two-way radio/TETRA-based products to increasingly data-orientated platforms delivering information across the site in real time. Recent months have seen several high-profile roll-outs of TETRA-based technology at airports around the world, including the huge BH Airport in Brazil, as well as Liberty International in Newark, New Jersey. With equipment provided by Motorola Solutions in the case of the former and PowerTrunk for the USA site, both projects prove the enduring appeal of narrowband in a mission-critical context. The roll-out so far has involved the provision of around 200 terminals, linked into the system’s centralised ‘zone controller’, which tracks the use of radio resources across the facility. The airport dispatch centre is currently managing roughly 23,000 push-to-talk calls a day. According to Goulart, the system has been a particularly good fit because of the ease with which it allows talk groups to be convened and disbanded, something which occurs on a flight-by-flight basis across numerous teams. As well as the system’s talk functions, the facility is also using features such as the ability to track the position of users via the radios. Goulart indicates that in the future, BH Airport may desire to integrate the company’s PTT over broadband technology into its operations. If so, he says, this will allow the airport to link up all its digital communication devices, as well as enabling functionality such as push-to-talk using smart devices. He is unable to identify when this might occur. Another airport that has recently made the jump to TETRA is Liberty International (EWR) in Newark, with the system in that case being provided by PowerTrunk. Installed in a project led by Rockwell Collins, the New Jersey site is the fourth in a series of airport roll-outs orchestrated by the two companies across the United States, taking place over the past five years. As with the Motorola deployment in Brazil, EWR’s TETRA network is employed for mission-critical airline and aviation ground-based services. This includes the likes of airline ramp-area personnel, passenger services, ground handlers, terminal security teams and so on. PowerTrunk’s technology is likewise replacing the airport’s legacy solution, which in the case of Newark consisted of an iDEN system that was reaching the end of its lifespan. On how the radios are incorporated into airport operations in New Jersey, Ammons says: “The process of turning a plane around [getting it ready for take-off] revolves around the supervisor who’s positioned at the gate, co-ordinating numerous different services and people connected to a particular aircraft. They interact with one set of people for one flight, and a completely different set for the next. Revealing the context behind the deployment, director of radio technology solutions at Rockwell Collins, John Monto, says: “We needed a new radio system, ultimately because the previous one was being ‘sunsetted’ by its manufacturer, who had pulled support for the product. It was the same situation across all four airports. The recent roll-outs in North and South America show just how highly regarded TETRA is when it comes to the deployment of mission-critical digital comms. 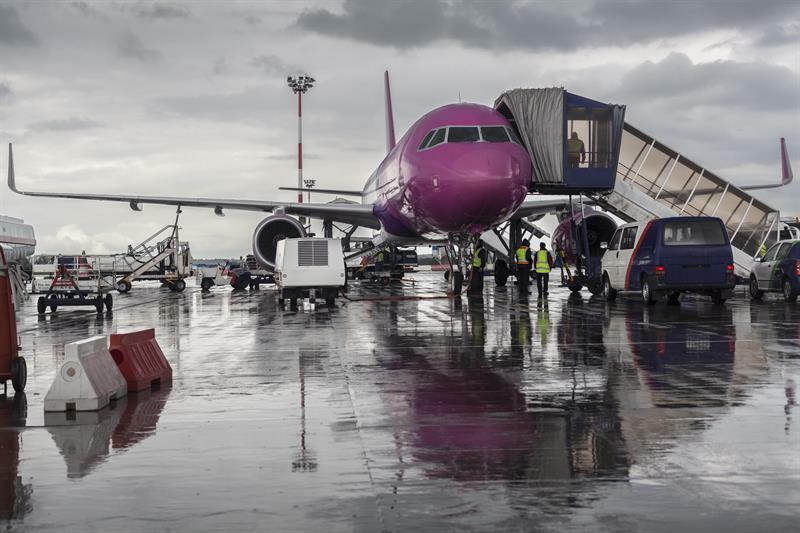 At the same time, however, numerous airport management solutions are now also being developed which take full advantage of the capabilities of LTE, particularly in relation to the use of data. A high-profile example of this is the recent implementation of a community app and ‘VisionAir’ solution at Gatwick Airport, providing crucial up-to-the minute information to both staff and passengers. According to figures published by Airports Council International, as of 2016 Gatwick was the second-busiest airport in the UK after Heathrow, processing more than 43 million passengers a year. With that in mind, arguably the most pressing issues around workflow and logistics are those presented by large volumes of people moving around the airport at the same time. Discussing how the apps are designed to mitigate these concerns, principal consultant at developer AirportLabs, Ligiu Uiorean, says: “Essentially, we saw an opportunity to develop a real-time communication channel for use by airport staff, with the focus on helping them make more informed decisions. “In the aviation sector, an improvement in efficiency of just a few per cent can make a massive difference, particularly if you’re dealing with millions of passengers a year. Once downloaded, the app furnishes users with a plethora of relevant information, delivered in real time. The majority of this data is brought in from sources such as the Airport Operational Database (AODB), as well as third-party providers including train operators and the police. Going back to the subject of queues, meanwhile, pertinent information arrives via sensors dotted around the facility in optimal locations. As well as its current innovative use of data to keep staff and customers informed, Gatwick has also evolved its control room operations through the use of APD’s software-only Cortex ICCS (integrated communication control system) solution. Designed to be adaptable across numerous verticals, Cortex enables users to consolidate the different aspects of their internal business comms effort onto a single digital system. According to the company’s managing director Mike Isherwood, it has proved particularly useful in an airport environment because of the disparate nature of the tasks that need to be carried out by ground staff, as well as the potential number of different systems deployed across a single site. Regarding its use at Gatwick in particular, he says: “Communications taking place in the airport go straight through Cortex. That could be anything from two-way radio comms between staff on-site, a passenger calling for assistance at a help point, to communication with on-site emergency services. He continues: “With any system, the first thing we do before we even think about installation is to sit down with the client and work out exactly what they want to achieve. This means looking at the technology they already have, which with Gatwick was essentially based around a 20-year-old Ericsson dealer board. “For me, the really important bit comes in understanding how the organisation functions operationally, and we then look at how we can improve or complement the existing processes. Commercial aviation is currently facing numerous challenges, ranging from questions around commercial viability to the seemingly never-ending threat from global terrorism. Thankfully, digital comms technology is proving invaluable in helping to make sure everything functions as it should when it comes to getting passengers in the air.